COMMENTARY – Not unlike the NFL, the Pac-12 continues to cannibalize itself. After just two to three conference games (depending on the school), only three of the 12 teams remain unbeaten in conference play. Utah stands alone as the sole undefeated team in the South, with Washington and Washington State atop the North. Admittedly, the Utes have only played one conference game. But unlike a lot of other teams, they won that game. They have done everything that has been asked of them, and they have been up to the task … so far. Will Utah stay undefeated? Highly unlikely. Can they still contend for a Pac-12 South title and finally find their way to the Pac-12 title game? Quite possibly. That’s why they play the games, because we’ll never know until the games are played. Last week’s bye came at a very opportune time for the Utes. It is always a tall order to get through the season without injuries to key players. In just four games, Utah has already suffered injuries to key players. So, while the rest of the conference continues to get beat up, the Utes had an opportunity to heal up. On the offensive side of the ball is quarterback Tyler Huntley and running back Armand Shyne. Whittingham has already announced his intention to redshirt Shyne. But Utah only talks about season-ending injuries. The good news is that there is precious little news on Huntley, which means he is still in the hunt. We’ll find out if he is well enough to play come Saturday night on The Hill. On defense, key contributors Kylie Fitts and Chase Hansen have been banged up more often than not. Hansen only played one of the last two games, missing the San Jose State game completely. Fitts missed the second half of both the San Jose State and Arizona games. Both players are catalysts for the defensive engine. Both players could use the rest in order to be at their best. 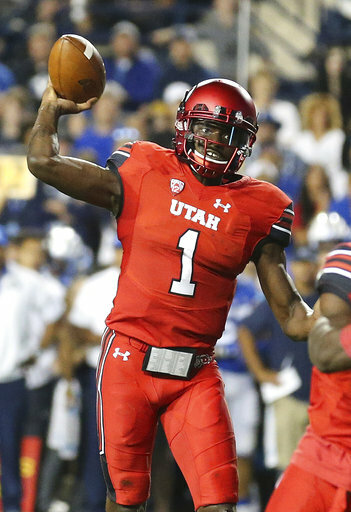 The bye week also meant that the Utes essentially tread water in the national polls. Utah stayed put at No. 20 in the AP Poll, and moved up a single spot to No. 18 in the Coaches Poll. It’s back to business this week. Say what you will about their non-conference schedule, but nobody can complain that the Utes’ conference schedule is not tough enough. The Utes’ remaining strength of schedule currently ranks fourth highest in the nation. Of Utah’s remaining eight opponents, only one currently has a losing record (Arizona State), three are ranked 14th or higher (USC — 14, Washington State — 11, and Washington — 6), and two are undefeated (Washington and Washington State). As Gary Larson, the genius behind the Far Side cartoon, once had a nerd in hell famously say, “Hot enough for ya?” The Utes’ schedule is red hot. Fans better buckle up, keep their arms and legs inside of the ride at all times, have fun, and enjoy the ride! Next up is Stanford. The Cardinal comes to town for yet another late-night start at 8:15 p.m. on Saturday night. Stanford broke in a new starting quarterback in K.J. Costello against Arizona State last weekend. Running back Bryce Love was also impressive, setting a school single-game record with his 301 rushing yards. Love already has more than 1,000 yards rushing for the season. In many respects, Stanford will be somewhat of a repeat of the strength-on-strength showdown Utah just had with Arizona. The Utes continue to lead the conference in rushing defense, while the Wildcats lead the conference in rushing offense and the Cardinal is a close second. Similar to Arizona, Stanford is the near the bottom of the conference in passing offense and middle of the pack in total offense. When looking at the matchup as a whole, even assuming that the Ute defense and Cardinal offense are evenly matched (although Utah’s defense should have the advantage against an overwhelmingly one-dimensional offense), the Ute offense should be better than Stanford’s defense. Add in the friendly confines of Rice-Eccles Stadium and the support of its rabid fans, and Utah should be in a position to control its own destiny and come away with the win. Here’s hoping the Utes can keep their record unblemished this Saturday and continue to give their fans a reason to cheer as they continue their meat grinder of a conference schedule.